What does 'Cloud Saving' actually mean you ask? 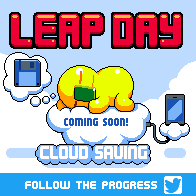 -It keeps all of your Leap Day data synced to play across all of your devices, neat! Meaning you can play on one device and carry on your progress on another. -Never lose your characters and level progress ever again. Gone are the days of broken devices and lost save date, huzzar! -And finally trying to see if we can improve lag across various devices. These bugs and improvements may get fixed in small batches depending if and when and if they are fixed. We are aware of some other small issues like the frozen upside-down octopus, the eggs that sometimes bounce off your head and the occasional small escaping bugs and wall plant spitters. We may fix these too given time. But for now we want to give ourselves time to create new stuff instead of just patching rare hard to fix bugs.